A few years ago, I was able to attend a wedding between two close friends who were both Game Night regulars. It was awesome and a ton of fun and appropriately geeky. Now, it's been my pleasure to attend two more Game Night wedding events - both couples actually met at Game Night. Barb & Andrew had a small family-only ceremony, but for their reception, they rented out the local game store and invited much of the game night crew. They didn't have a first dance - they had a first game. They didn't have a Dollar Dance - they had a dollar game. For their bouquet and garter, they had mini-tournaments. There were open games on every table, and guests were encouraged to play. There were signups so you could play games with the bride and groom. All in all, it was well-done and a ton of fun. And I am very glad I was able to attend. Barb & Andrew are the couple Steph and I occasionally get to play Mah Jong with, so we gave them a set (and a copy of the book I used to learn the game). Derek & Selena's ceremony was a ton of fun. The ceremony itself was in rhyme with a meter that was deliberately reminiscent of Dr. Seuss. Selena used to attend Game Night since it was held in my apartment, more than a decade ago. Derek didn't start attending until after we'd moved to the game store. When Jim moved to California, Derek was my closest rival at Game Night. Even though he beat me at everything, it was usually a close match. Neither of them are regulars at Game Night these days, and I miss them both, so I'm glad I was able to attend their wedding. It was good to see them again and spend some time chatting. It was also good to see friends who I don't get to see very often. I think one of the highlights for me was when one friend asked me, "You still doing that game thing for that publisher?" "Dude," said another of his friends, "They're not that little. They just bought Days of Wonder!" Either way, it's been two weekends surrounded by people I wish I could see more often. Thanks to both couples for the invitations. I'm glad to have been a part of your celebrations. Last week, I finally had the chance to play Lords of Xidit. Lords of Xidit is apparently a new version of a game previously called Himalaya. As with many new versions, there are a few changes. Unfortunately, I don't know Himalaya, But there is a file that Libellud put together that lists the changes. In Lords of Xidit, you will program your turn six moves (one year) in advance. Each move, you can either move, take action, or pass. Moves involve moving your piece along a colored road to the next city. Taking action is either recruiting the lowest-value troop in a given city or spending troops you have recruited to deal with a threat. And passing is ... well ... doing nothing. The pieces are good. The board is bright. The rules are pretty straightforward. The only complaint I have with the game is one of player interaction: There isn't much. Because you're programming six turns in advance, any player interaction is limited to timing things. In fact, that's why "Pass" is an available action. Since you can only recruit once per city per year, and you always recruit the lowest-valued unit in a city, you will sometimes want to pass so that your opponent can draft first and grab that peasant. Recruiting is easy. Just show up and take action. Dealing with the threats, however, is a bit trickier, because each threat is a monster who is menacing that city. And each monster requires a specific set of troops to be defeated. Some of them are easier than others. And each threat gives you a reward for defeating it - more on that in a few minutes. But if you defeat a threat two actions before I was programmed to go to that city and defeat that threat, I'll get nothing. My "Action" turns into a "Pass." Which, as I'm sure you can guess, is a bit frustrating. So the extent of the player interaction is trying to figure out who will be where and at what point so that you can either get there ahead of them to deal with the threat or just after them so that you can recruit the better troop. Three times during the game, a census is held, and the players who have the most of each type of troop will gain a benefit of some sort. These benefits are identical to the benefits you'll get from slaying monsters, only toned down (usually). Each threat tile has three specific benefits printed on it. You can choose two of the three. You will either win money, fame (in the form of bard tokens) or the support of the Wizards' Guild (in the form of a Wizard's Tower marker). Early in the game, players will scramble for the Guild markers, because each city's branch of the Guild will only support one player. Later in the game, money and fame become more important. After twelve years, a winner is determined through a knockout. One of the three victory conditions (which are tied to the three possible rewards) is calculated, and the player is last place is eliminated. Then the second condition is calculated and, again, the player is last place is eliminated. Finally, the third condition is checked, and there will be only one player left standing. If you have five players, then the first condition eliminates two players instead of one. The order the conditions are checked is random, and changes every game. However they are set up before play starts, so players know which conditions are most important to avoid elimination. But you can't ignore any of the conditions. 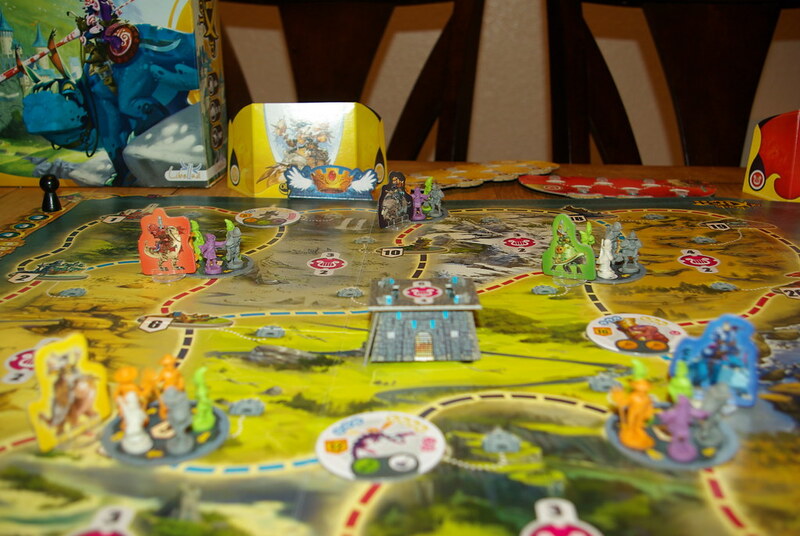 Your first play of this game will - like many games - be a lot of random flailing and looking for the strategy. After multiple plays, you'll start to look at the "upcoming" part of the board, where you can see where the next few threats will appear so you can be there and ready before they are even on the board. Long-term, I think the game has legs. It's not the best game I brought back from GenCon, but it's a long ways from the bottom of the pile. I don't expect this to hit the table every week, but I do think it's going to be a regular fixture in my car so that we can play it if we want to. And it looks like I'm not alone in that train of thought, either. 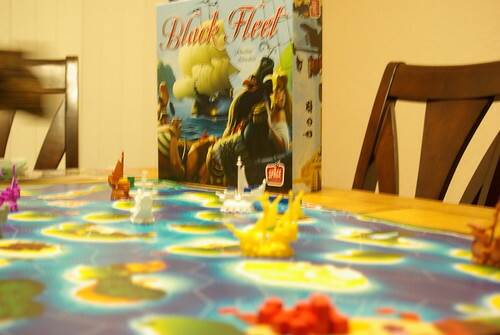 One of the games we brought home from GenCon was Black Fleet. It's a simple pickup and deliver game with a couple of "Take That!" elements. And some of the cutest/best bits I've seen in a while. The goal of the game is simple: Rescue the Governor's Daughter by raising enough money to pay for her ransom. Each turn, you'll play a card. This card allows you to move three ships - your merchant ship, your pirate ship, and one of the navy's ships. The card may also allow you to draw some other cards that do a variety of things. The goal of the merchant is to haul cubes from one location to the next. The goal of the pirate is to steal cubes from merchants and then bury them. The goal of the navy is to sink the pirates. Merchants start with and can carry three cubes, pirates can carry one cube, and the navy doesn't bother with these goods cubes. Hauling cubes to a port gives you money. Attacking merchants gives you money. Burying treasure gives you money. Sinking pirates ... gives you money. Surprising, no? What is surprising is that the money is metal coins. Small metal coins, but still metal coins. Each player has a bunch of upgrade cards in front of them, too. Every player has a different set of upgrades, too. One upgrade that I had allowed my ships to move across island spaces. Another gave me extra money when my merchant sank a pirate. One of my opponents had a merchant who was capable of sinking pirates. You need to purchase all of your upgrades before you can pay the ransom for the Governor's daughter. As I said: It's not a difficult game. In fact, it's quite simple. You could play this with a ten-year-old. It's not a game that will hit the table every week for me, but it's also not a game that will be banished to the garage. I look forward to playing this one some more.